On Tuesday, September 2nd, Sanborn opened the season with the 35th anniversary of the Jamie Martin Invitational. Traditionally a flat and fast course with the first and final 600 meters across the common in Kingston. This year’s version saw some fast times. After a delayed start due to pop up thunderstorms and heavy down pours, the event lived up to its tradition. 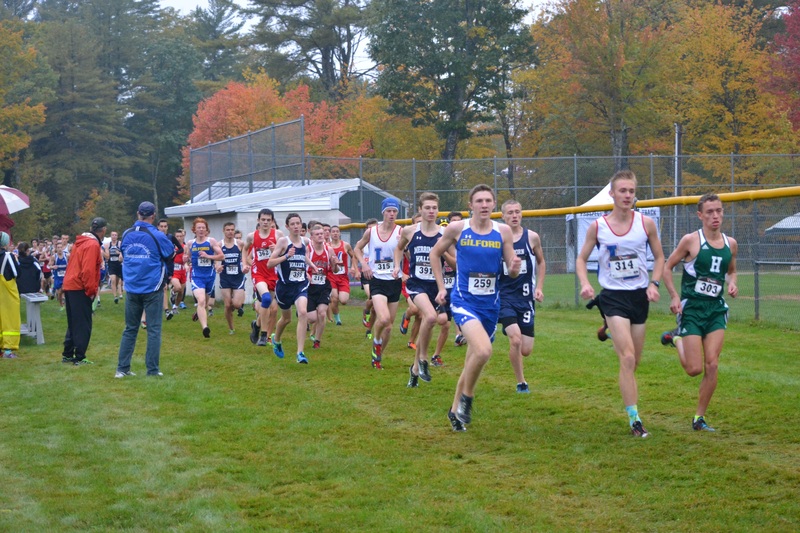 The boys race got off to a fast start when Ryan LaFrance of Gilford, Tim Fafard of Mascenic, Sean Munelly of Campbell, Hunter Miller of Kingswood and a host of others hammered down the town commons. At the mile, the lead pack had thinned to single file, with LaFrance leading last year’s winner, Fafard and Miller. There was a small gap back to the chase pack and then the rest of the field. Things would change on the way back. By two miles, LaFrance had gapped Fafard, and Avery Traffie of Mascenic was closing hard in third. The trio would finish that way, with LaFrance winning in 16:34, matching Fafard’s winning time from last year. Cody Murphy of Goffstown and Ehsun Farooq of Manchester West would finish fourth and fifth. Mascenic was able move up two spots from last year, with a win over Goffstown, mostly on the strength of their supporting runners. Returning athletes averaged a 70 second improvement over last year elevating the team’s profile big time. And while the points spread appears similar to the H-B girls (26 points instead of 29) this race seemed much closer. Mascenic put 4 athletes in the top 25, with their 5th taking 32nd. Kingswood held down third, H-B took fourth and Pelham mirrored the girl’s performance finishing fifth. Previous post 2013 WHERE ARE THEY NOW?